This home is your perfect summer getaway or your perfect winter retreat! 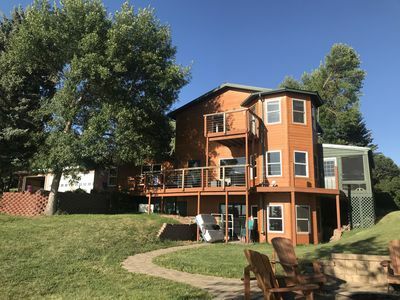 It is the ideal place to stay for summer water recreation and fishing, pheasant hunting in the fall, or ice fishing in the winter! It is located on Lake Sakakawea in Douglas Bay which is a 20 minute drive from Garrison, ND. This beautiful home sits right on the shoreline for beautiful views and easy access to the water. It features 3,000 square feet of finished living space. The main floor has a mud room/entry with plenty of space for coats, boots, coolers etc. and extra fridge and freezer space. Washer and dryer are located on the main floor and available for use-please bring your own laundry soap if you plan to use it. It also has a beautiful kitchen with all the necessary appliances, pots and pans, dishes etc., a counter with 2 stools, and a dining table that seats 6. An electric fireplace is located in the kitchen/dining area. The main floor also features a large family room area and a small TV room. There is also 1 bedroom with a queen sized bed and 1 full sized bathroom located on the main floor. 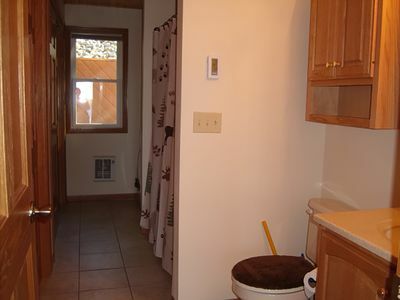 The upstairs features a full sized bathroom and 2 more bedrooms. One bedroom has a king bed and the other has a queen. The downstairs family room area has been turned into a family style bedroom featuring a king bed, a queen bed, and a twin bed. There is a full bathroom downstairs as well and a non-egress bedroom with a queen bed. 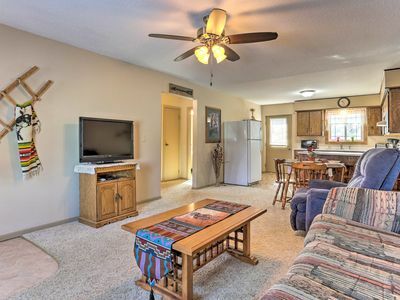 Off the main floor is a front deck with patio furniture seating and a screened in porch. The screened in porch features 2 large outdoor tables with seating for 12. The gas grill is located by the patio and is available for use. An outdoor firepit area with seating is also available for use. This is a non-smoking home and there are no pets allowed inside the home. Wifi is available at slower speeds. There are two flat screen TV's in the home. One is located in the master bedroom on the second floor and the other is in the TV room on the main floor. The TV's are both equipped with DVD players to access your own Netflix account. In the summer, a private dock is available for use directly in front of the home. Perfect quiet home in the middle of the Prairie. Turtle Lake (population 600) is in the heart of North Dakota. 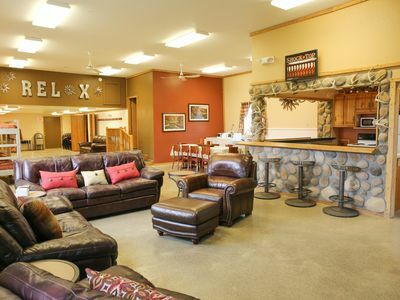 Centrally located off Hwy 83 between Minot and Bismarck, you're just about an hour away from either airport. Turtle Lake has just about anything you would need. Groceries, eating options, gift shops, bar and hospital. With several local lakes between 1 and 15 miles of town, year round fishing is a favorite past time. 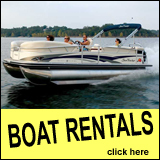 Boating in the summer and snowmobiling in the winter provide hours of fun. Renovated summer 2017 with nine foot ceilings, living Room, dining Room, eat-In breakfast nook kitchen, two full size bedrooms, one nursery, claw foot tub in new bathroom! front porch, large back yard with gardens and fruit trees and picnic table, access to alley from model T garage, off street front and back parking, and huge stone basement with Washer and Dryer (basement great to store hunting/fishing gear safe and secure, will consider allowing keeping dogs in basement). 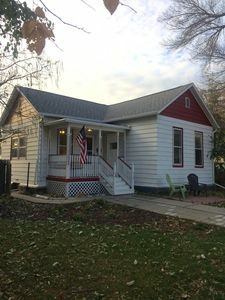 One of the oldest homes in Mandan, dating from 1870s, was a Sears and Roebuck home shipped across the plains for a foreman of Northern Pacific Railroad when Mandan was the western terminus. Much of home restored and appointed to the era, but with modern central heat and updated kitchen. Walk to coffee shops, bars, restaurants, and shops downtown and at the restored NP Railway Station. Three churches within 5 min walk, as are bike trails and swimming hole on the Heart River. You'll never want to stay in a hotel when visiting Bismarck-Mandan again. Just 7 miles to the Bismarck Capitol, too. Great for travelers looking for an overnight stop, or for HUNTERS and FISHERMAN, too. 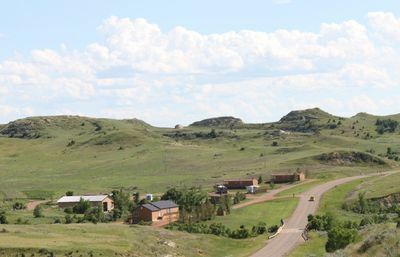 Easy drive to surrounding hunting grounds, as well as Medora. 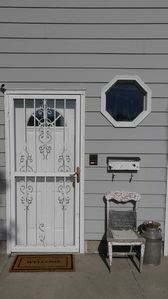 Our rental has been updated from head to toe lovingly by my hunk of a husband and decorated by yours truly, Miss Leah. We have purposed this space to be beautiful and functional as well. The unit has window a.c. so it stays nice and cool in the summer. You have control of the thermostat. Set the temperature you desire. We provide our guests with a NEW K-Cup Coffee Maker, toaster and NEW slow cooker. The fridge is stocked with bottled water, juice, Keurig Coffee, tea, and some quick breakfast items for the morning. The kitchen features Brand NEW Cuisinart pots and pans and new dishes. You can cook like a boss! The living room has two couches. Each couch can accommodate a guest. We will provide the pillows and a blanket for you. If you are a long-term guest, we setup the home with essential items but it is your responsibility to restock as items run out (ie toilet paper, breakfast items, laundry soap). Guests get one parking space on the driveway for a vehicle. If additional parking is needed, there is tons of on street parking available around this home. Guest access This is the main floor apartment of a duplex. NO Stairs!!! You enter through a locked entry at the garage door (this door is shared with the upper unit). There is an entryway that has the locked doors for both units and the shared laundry room. The laundry room has a washer and dryer for your convenience. Interaction with guests We don't live at this house. However, we do like to check our guests in personally and help with luggage whenever possible. We answer any questions you may have and get you checked in. If we aren't available, we do have a lock box for self check-in. In the summer, we usually always have an abundance of veggies from the garden we would love to share. Other things to note We love to travel as a family. We love kids. We have four. We welcome guests with children. That being said, our home isn't out of a magazine from a Pediatric Specialist. Hazards that apply to children are (*Hazards are not limited to just these. Children have a knack of finding ways to get hurt. ): -Our kitchen doesn't have child locks on the drawers and cupboards. Knives and cooking utensils are in the drawers which aren't locked. -The outlets aren't covered in the ENTIRE unit. -In the bedroom, the nightstands and lamps aren't anchored. -In the bathroom, the blind does have a string to make the blind go up and down, the drawers and cabinets aren't child-locked, the toilet doesn't have a anti-drowning lock, and children have to be watched in the bathtub as our plumbing is older and if turned on high could burn a child. -The living room/dining room and bedroom have blinds that have a string that could pose a strangulation hazard to children. If you are okay with these hazards and accept FULL liability for any accidents your child/children may have, we gladly welcome you and your family. Children are a blessing:) The garage is a storage place for excess building materials we have. It is not a place for guests or children to hangout or play. Guests accept full liability for any accidents. The garage is simply a place for guests to pass through to enter the entry for their unit. Private and completely updated one bedroom one bathroom apartment located above my home's garage. 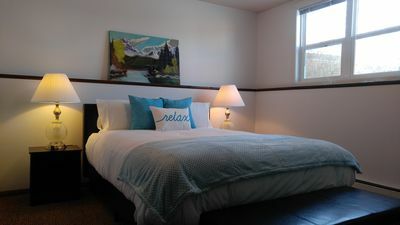 The unit has all new furniture including the bed, new 48" Samsung TV, and all new linens. Off-street parking, free WiFi, and Netflix. 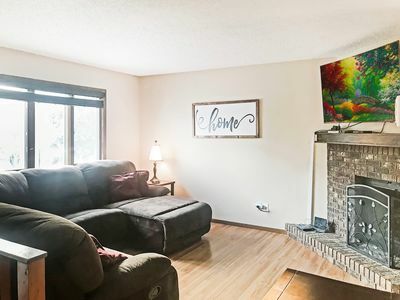 Conveniently located approximately 5 minutes from both of the hospitals, shopping, Bismarck Civic Center and ND State Capital. Come and relax and recharge in this beautiful space. During the summer, we love to share the abundance of our garden with you as well. Our rental has been updated from head to toe lovingly by my awesome husband. We have purposed this space to be beautiful and functional as well. The unit has central air so it stays nice and cool in the summer and warm in the winter. Guests have control of the thermostat. Set the temperature you desire. We provide our guests with a Keurig Coffee Maker, toaster and slow cooker. The fridge is stocked with bottled water, juice, Keurig Coffee, tea, and some quick breakfast items for the morning. Emeril pans allow our guests to whip up a delicious meal quickly. The living room has two couches. Each couch can accommodate a guest. We will provide the pillows and a blanket for you. We have a high chair and pack and play for guests to use during their stay. Please let us know if you would like to use them and we will have them set up for you when you arrive. If you are a long-term guest, we setup the home with essential items but it is your responsibility to restock as items run out (ie toilet paper, breakfast items, laundry soap). Guests have access to their unit which is above our garage. They access the unit from a private entrance. We live on site in the main house. We LOVE sharing meals with people and hearing about others lives. If our schedule allows, we would enjoy sharing a meal with you. We love to travel as a family. We love kids. We have four. We welcome guests with children. That being said, our home isn't out of a magazine from a Pediatric Specialist. Hazards that apply to children are (*Hazards are not limited to just these. Children have a knack of finding ways to get hurt. ): -Our kitchen doesn't have child locks on the drawers and cupboards. Knives and cooking utensils are in the drawers which aren't locked. -The outlets aren't covered in the ENTIRE unit. -In the bedroom, the nightstands and lamps aren't anchored. -In the bathroom, the blind does have a string to make the blind go up and down, the drawers and cabinets aren't child-locked, the toilet doesn't have a anti-drowning lock, and children have to be watched in the bathtub as our plumbing is older and if turned on high could burn a child. If you are okay with these hazards and accept FULL liability for any accidents your child/children may have, we gladly welcome you and your family. Children are a blessing:) Our home is one block away from a park with a children's play area, basketball hoops, and soccer practice area. We are also just a few blocks away from Lions Park. Lions Park has a NEW aquatic center with water-slide and 2 pools, tennis courts, several park-sets, skate park, frisbee golf course and 3+ miles of walking/biking trails. Guests have a private off street parking spot on our driveway. We are located just north of main street in Bismarck. We do not live in a suburb as one of our reviews state. Our home is conveniently located and a short drive to anywhere you want to be in Bismarck/Mandan area. You can see the ND State Capital from our front yard. Alot of our guests have used Uber to get around. They have had good results with Uber. This is a 3 bedroom 1.5 bathroom home. The main floor features a kitchen with eat at peninsula, new paint, flooring, and stainless steel appliances, a dining room with sliding doors to deck, a living room with cozy fireplace, and a half bathroom. Upstairs there are 2 large bedrooms, and a full bathroom. The lower level has a laundry room with washer and dryer included, family room, and an additional bedroom. Enjoy the heated pool and a sports court on those warm summer Days! 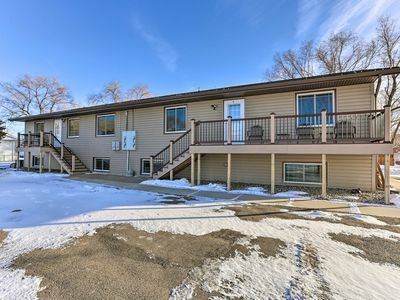 Minutes away from downtown night life, Hospitals, airport, capital building, and the University of Mary! 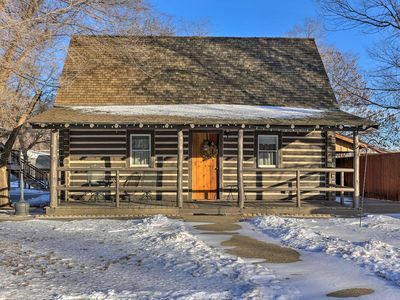 Fully furnished cabin has everything you need for an easy stay. 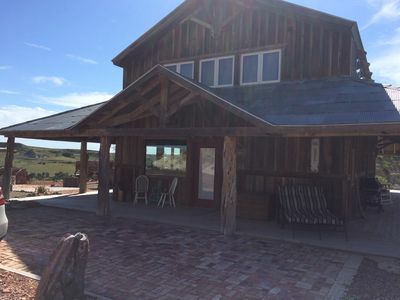 Enjoy awe inspiring views of the badlands from the front porch. This 2BR comfortably sleeps 6 with 1 queen size bed, 2 twin beds and a pull out queen sofa. Guests share 1B with shower/tub combo. Kitchen comes with daily essentials. Minutes to everything Medora has to offer. Bring your horse, bike, and golf clubs. We look forward to your visit! 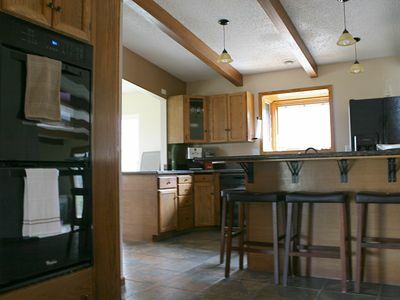 This spacious Fully Furnished 4 bedroom, 3 bath, house located in the heart of the badlands. We are located less than 2 miles from Medora. The property is surrounded by national grasslands which provide for excellent photo back drops, along with hiking, horseback riding, ATVs . Guests will find a fully loaded kitchen and living room to fit your needs. A wrap around deck with ample seating. Take in the beautiful views of the badlands while relaxing in the jetted spa provided; a great way to begin or end your day. Private quarters on the north end of the house with Queen + Full Murphy bed, and full Bath, great for privacy or large parties. We can accommodate large groups with our house, 3 cabins, and 16 RV hookups all available on the property. Great location for just enjoying the quiet views of the ND Badlands. Golfing, shopping, and TRNP only minutes away. *PLEASE NOTE; Downstairs of this property is occupied. Fully furnished cabin has everything you need for an easy stay. Enjoy awe inspiring badlands from the front porch. This 2BR cabin comfortably sleeps 6 with 1 queen size bed, 2 twin beds and a pull out queen sofa. Guests share 1B with shower/tub combo. Kitchen comes with daily essentials. Minutes to everything Medora has to offer. Bring your horse, bike, and golf clubs. We look forward to your visit! 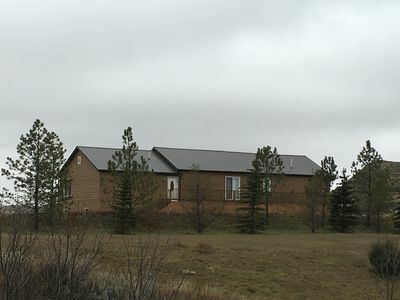 Executive 4 Bed 3 Bath on 2.27 Acres. This impressive home is serene country living at its best. Within 6 miles of Target, Kirkwood Mall, Civic Event Center and Walmart! 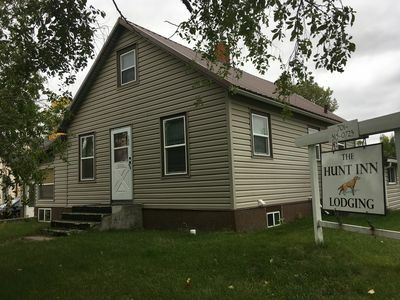 This property is minutes from University of Mary, river, bike path and all the city of Bismarck has to offer. Weather your in town for city events or quite country rest this house fulfills it all. You will enjoy the tranquility of watching turkeys with their young eat in the fields and the horses grazing in their pasture, taking a walk to see the sunset on the River. 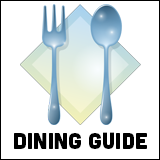 Enjoy dinner at a local restaurant with a movie, play or show at one of the local theaters. Or if you are a larger group this house entertains beautifully for small gatherings! The neighborhood is like taking a step back in time. Just what you need to get away. Be near the city and not in it. Welcome to Jan’s RV Park & Lodge, Leeds, North Dakota! Leeds is in the heart of some of the greatest hunting and fishing in the world. Jan's RV Park & Lodge is located right next to Highway 2 midway between Devils Lake and Rugby North Dakota. We are smack dab in the middle of it all! Are you looking for a cozy, but spacious home away from home? Well, you have found it! Throw some clothes in a suitcase, hit the road and we will have your home away from home all ready when you get here! Jan’s Lodge is 2200 square feet of living space. There are 2 spacious bedrooms with queen sized beds and another common sleeping area with 5 sets of bunk beds. There is room for 14 people to sleep. Available to you are 2 restrooms with showers, a great room with dining and relaxing space and a full kitchen. Everything is supplied for you: towels, bedding, cookware, dishware, grill and etc…all that you need to make your stay worry and hassle free. Throw some clothes in a suitcase, hit the road and we will have your home away from home all ready when you get here! The Lodge is open all year round. Meeting / Conference Space Are you looking for a venue for your next meeting, training event, guys/girls weekend, quilt retreat, holiday gathering, family reunion, birthday, wedding party or get-together? We’ve got you covered! Jan’s Lodge seats about 65 people comfortably. Many of our customers have commented that Jan’s was the perfect place for their event because it was so inviting…and just like home! JAN’S LODGE - Groups – hunting, fishing, working, playing - 2200 square feet - Full kitchen - Free WiFi -Satellite TV - 2 restrooms, one is handicap accessible - Sleeps 14 – 2 bedrooms with queen sized beds, plus a shared sleeping area with bunk beds - A great room with ample seating for large groups - Jan’s supplies everything…bedding, towels, cookware, etc. - Kids under 16 stay free There is also a 14 site RV park on site. Plan an event and host it at Jan's Lodge. Have your guests bring their camper and stay at Jan's RV Park. **************** CANCELLATION POLICY **************** The policy below supersedes any other listed elsewhere on this property listing. We have a flexible policy and are eager to accommodate any unforeseen circumstances. For a full refund of accommodation fees, cancellation must be made five full days prior to listing’s local check in time (or 3:00 PM if not specified) on the day of check in. For example, if check-in is on Friday, cancel by the previous Sunday before check in time. If the guest cancels less than 5 days in advance, the first night is non-refundable but 50% of the accommodation fees for remaining nights will be refunded. If the guest arrives and decides to leave early, 50% of the accommodation fees for the nights not spent 24 hours after the cancellation occurs are refunded. Quiet little cabin on Lake Metigoshe! Come watch the sunset on the deck of this cute comfy cottage. 50 ft of shore line with dock and fire pit! 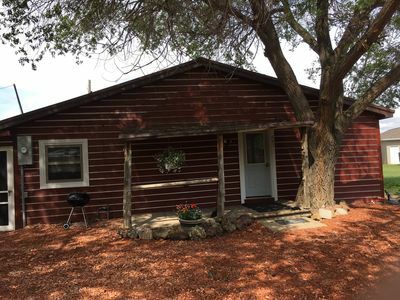 This 2.5 Bedroom 1 bath cabin sleeps 5-6 people! Great views, close to store and restaurants across the street is the lake loop walking/ bike path. Master bedroom has queen sized bed, bunk beds in the upstairs bedroom and a futon in the smaller room upstairs. Also washer and dryer and 1 car garage with 2 additional parking spots. There are plenty of snowmobile trails and great ice fishing, also a 10 min drive to Bottineau Winter Park for snowboarding, skiing and tubing! This a great Property for both winter and summer fun!! Peace & Quiet and Amazing sunsets await you! Enjoy this great vacation hideaway! 3 bedroom cozy cabin with amazing views of Canada! Full bath with washer and dryer. Open kitchen with a lot of room for meal preparation! Great living room and dining area with unobstructed view of the water. Grassy front yard with paver patio for those summer bonfires. 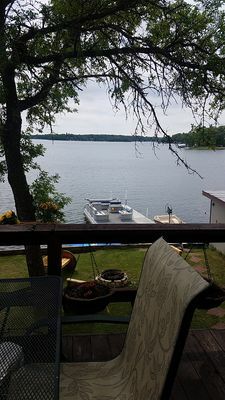 Great place for the family to enjoy the lake or a quiet vacation for 2! Weed free shoreline perfect for swimming! Lake Metigoshe has many activities and amentities available.